Inside: A look at our budget friendly patio makeover with tips for how to create an outdoor living room and dining area on a budget. With some really fun and easy DIY projects, I managed to turn my patio into an outdoor living room that we’ve already used ten times more than we did in the last 3 years combined! My only regret is that we didn’t do this sooner. I can’t wait to give you the tour and show you how we took our hum-drum patio and made it a true extension of our home and how you can use these same ideas to transform your outdoor space. The key is taking what makes our indoor spaces so cozy and making them work for outside! This is what we started with. No color, no where comfortable to sit, and just plain yucky. The first thing we did was invest in some nice outdoor furniture. 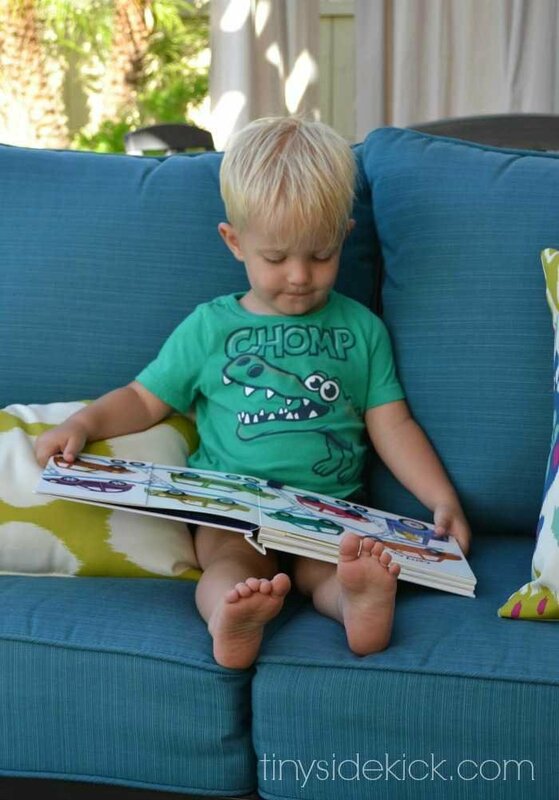 We did our homework when it came to shopping for outdoor furniture and knew that we needed it to be both low maintenance and comfortable. We found this beautiful Gatewood set at Lowes. I loved that I was able to chose from a variety of colors for the cushions and because it is metal we can wipe it down easily and won’t have to worry about maintaining the wood. *The Gatewood collection at Lowes is no longer available but I sourced similar metal seating sets and found these with the same shape and colorful cushions: grey metal set, dark wood metal chairs, or this metal set with clean lines. The furniture was by far the biggest chunk of the budget but we needed this space to be somewhere we want to be. We’ve already used this space almost every single day. It’s been the perfect spot to relax, watch the kids play, have a glass of wine, or read a book. When it comes to outdoor lighting we just didn’t have it in the budget to do wiring. 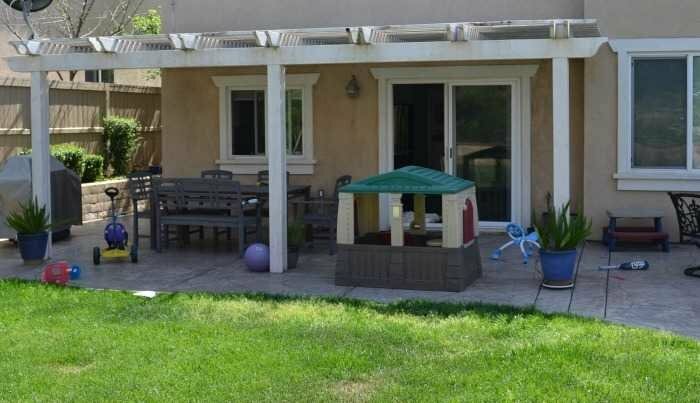 Besides, our 5 year plan has a pool in mind and with that, will probably come changes to this patio cover anyway. Right now was not the time to invest in outdoor lighting. 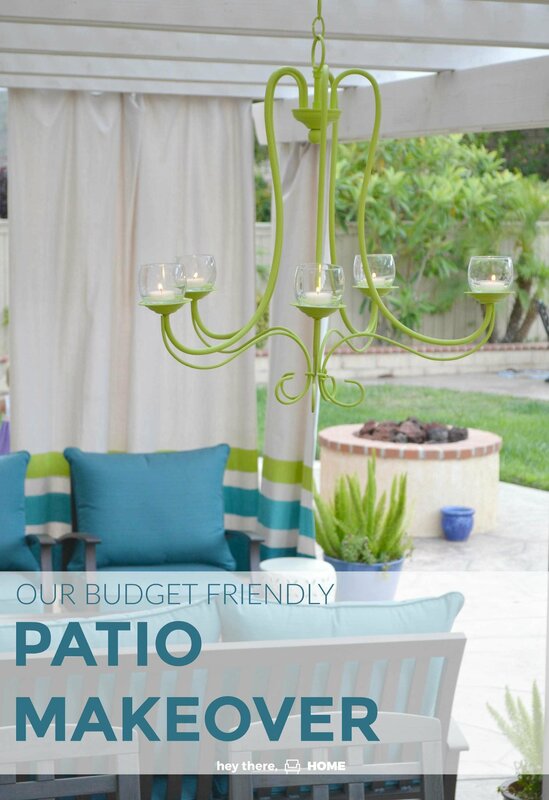 So we DIYed this Outdoor Candle Chandelier from an old dining room chandelier as an inexpensive solution. The outdoor candle chandelier didn’t cost us anything and is the perfect focal point for over our outdoor dining area. And the light it gives off is nothing short of awesome. And who doesn’t love a bright green chandelier? Something I definitely can not get away with inside my house but this was the perfect excuse to go bright and tie in to the rest of the outdoor decor. One of the things that make our indoor spaces so inviting is all of the soft textures. So when the goal was to want to relax the same way in my outdoor living room I knew I had to add some outdoor pillows and curtains. I toyed with the idea of sewing my own pillows with outdoor fabric but when I saw these ones at World Market, they were perfect! They went nicely with my furniture cushions and gave me the opportunity to add some more fun and bold colors to my color scheme! I love a good DIY project, but it would’ve cost me more to make them myself than it was to buy these, so it was a no brainer. The outdoor curtains on the other hand were something I knew I would have to DIY. Who knew outdoor curtains were so expensive? My DIY drop cloth outdoor curtains were a very budget friendly solution and I got to add the exact colors I wanted. If you haven’t already seen how I made these drop cloth curtains and the outdoor curtain rod you will want to check out this post. P.S. Lot’s are asking about the side table. It is metal which is great for having around the kids and I got it at World Market when I bought the pillows! We’d already started to spend a lot of time here when we realized that we were missing a surface that we could serve from. Then a little garage sale hunting led me to this diaper changing table that with a little DIY action I made a perfect outdoor beverage station. 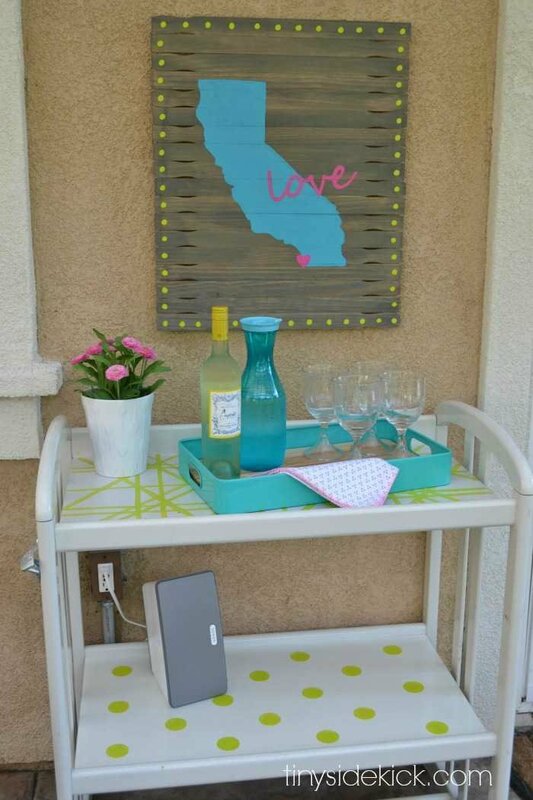 This outdoor drink station has been the perfect spot to set up drinks or munchies and is out of reach of the kiddos, which means more relaxing for this momma! 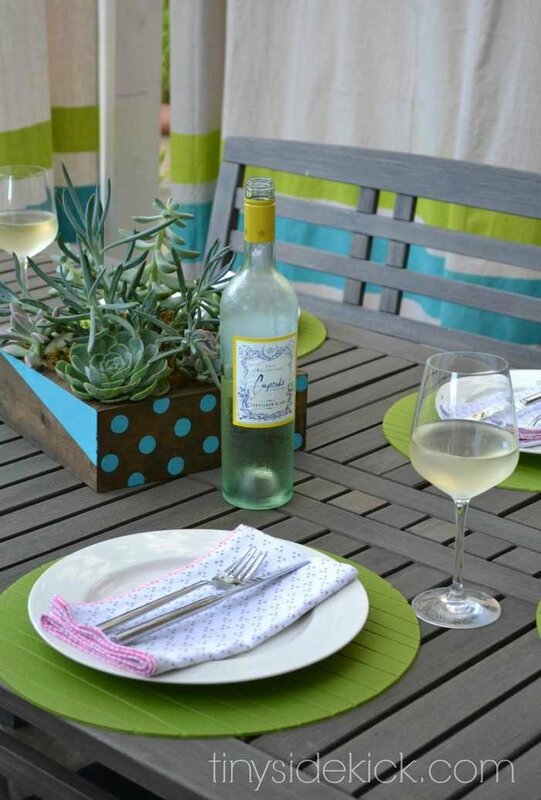 It also makes for a great sideboard when we have dinner outside. In this house no space is complete without music. But going back to the whole issue of wiring…it just isn’t in the budget. So when Sonos sent me this incredible and easy to move around sound system I was so excited to try it out! It isn’t something that we can leave outside all the time, but since it is so easy to move around, when we want music outside we simply carry a speaker out, plug it in, and control everything else from our cell phones or tablet! The last little element to finish off the space (and cover up our ugly stucco) was the addition of some outdoor art! We always think to put art on our walls indoors, so why it never really occurred to me to add some art outside is beyond me. Better late than never right? This simple piece of outdoor art was a perfect way to add just a bit more personality to my outdoor living room and finish off the look of my drink station. So what do you think? You want to come over for an adult beverage don’t-cha? Let me be the first to tell you that if you’ve always wanted to create an outdoor space, but year after year it’s at the bottom of the priority list, don’t put it off any longer! Being outside makes me feel so alive and has become one of our favorite spots to sit and chat after the kids are in bed or in the afternoon while the kids play. Heck, it’s become our go to spot for just hanging out without the temptation of the TV. This is what the afternoon around here looks like… snacking and reading, reading and snacking. Bliss I tell ya! 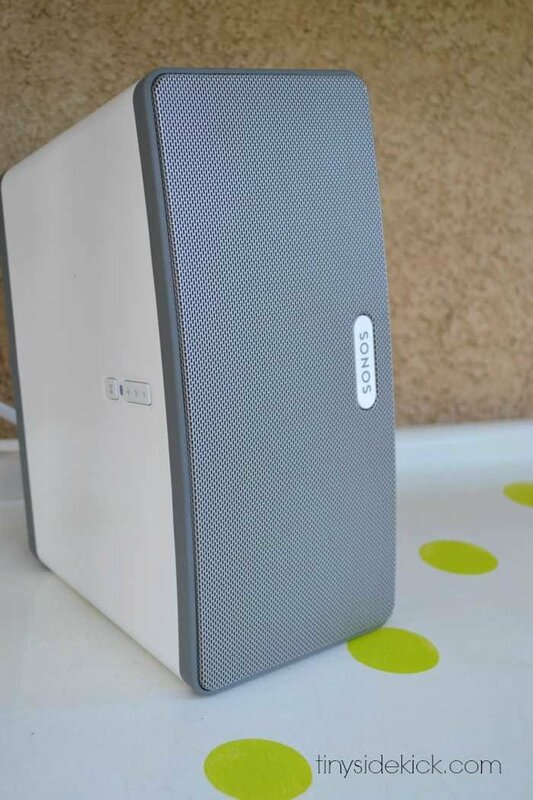 Maybe I do love technology…This Sonos Wireless Music System Is Rocking My World! When you revamp your patio cover and add electrical wiring, be sure to consider installing one or more overhead fans at the same time. Our porch was already roofed in when we bought the place and retrofitting it for ceiling fans was quite the little adventure. My role was to teeter on top of a ladder with my hand in the roof cavity and say “No, not yet” and listen to a lot of bad language until we got all the wiring fished through. It was worth it though. Here in Florida, overhead fans add three months to your outdoor relaxation. Bonus: flies and mosquitoes hate ceiling fans almost as much as you hate having them around you. Hi Mandy, thanks for that super helpful suggestion! What a beautiful back yard! And…exactly…like…mine? Then I saw your art. I swear you must be from the same community…Eastlake? Hi! I absolutely love your outdoor decor! These are all my favorite colors. 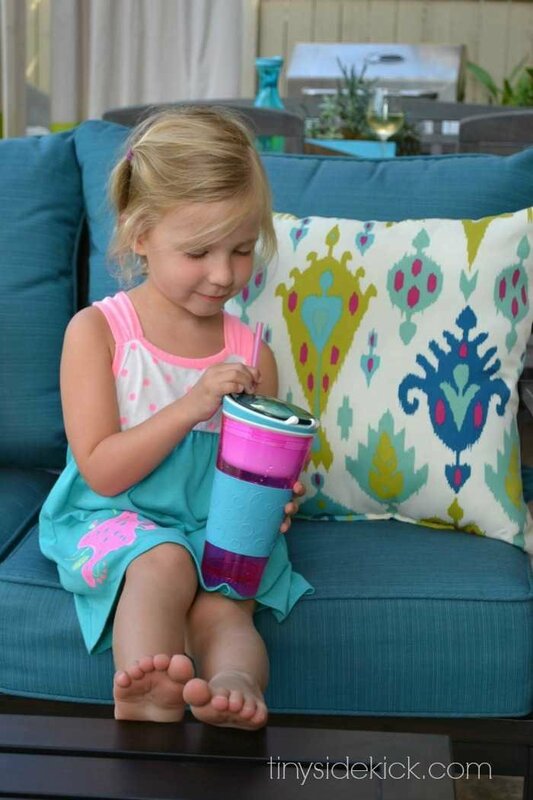 Could you please tell me if the Sunbrella fabric you’ve chosen for you cushions is Cast Lagoon? If not, what is the color? We’re renovating our RV and I’m doing the inside dinette and couch in Sunbrella fabrics and this is exactly the color I want! It looks like they aren’t making that patio furniture collection anymore. I’ll need to update with a similar product. The fabric came with the allen and roth set. I don’t think it was cast lagoon. Mine is definitely more teal. I found this fabric for you that is a pretty close match. Good luck with your renovation! Oh my goodness Tammy, I love the idea of adding wheels to the cart so you can move it around! You are welcome for a drink any time but it sounds like you are on your way to your own paradise! Your ideas are amazing! As soon as the weather breaks I am doing 4 of them 1. 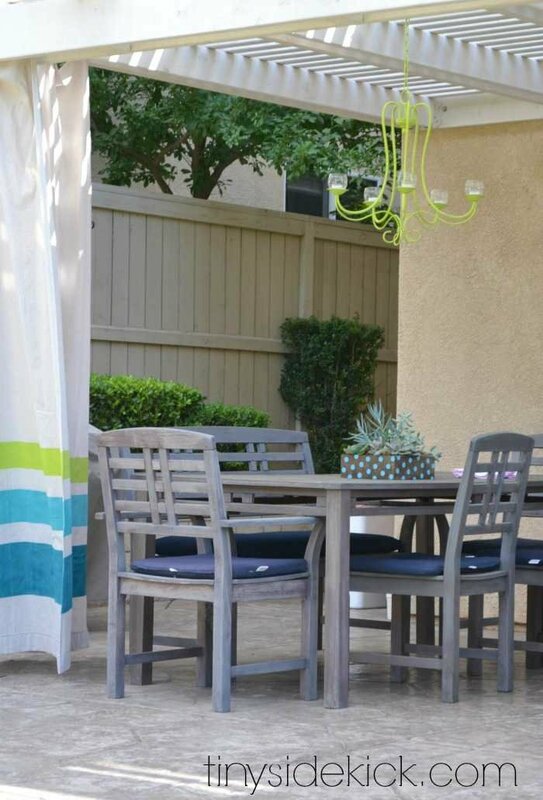 Drop cloth outdoor curtains with accent colors 2. Inexpensive curtain rods to go with 3. Candle chandelier (after I thrift store shop/craigslist/garage sale)4. Beverage station (after I thrift store shop/craigslist/garage sale). Can’t wait. Send me an address so I can forward you my before and after pics! I LOVE this Corey! Outdoor spaces are my favorite and I’m definitely going to have to try the Sonos! Oh my goodness what a beautiful space!! I wish we were having outdoor weather! Love the bright pops of color. Such a relaxing space! Fabulous, just fabulous! Love the colors and style! Thanks for sharing! Thank you so much for sharing this makeover! We are in the planning stages for making our backyard patio into a functional and enjoyable space and there is so much inspiration here. Is there any chance you could tell me where the candle lantern sitting next to you in the BHG photo is from? I love it! Hi Nicole! Thanks so much. The lantern is from Home Goods/ Marshall’s. Love the entire outdoor space, fantastic!! I also, have stucco, how did you hang you outdoor wall art? Hi Becky! Thank you so much. I hung the wall art with a screw. We drilled it into the stucco. Just be sure it is the right type of screw (for stucco) and you should be fine. Also, be sure that it is placed so that you can use it for different things throughout the years. What a great space! We love our Sonos speakers, too! 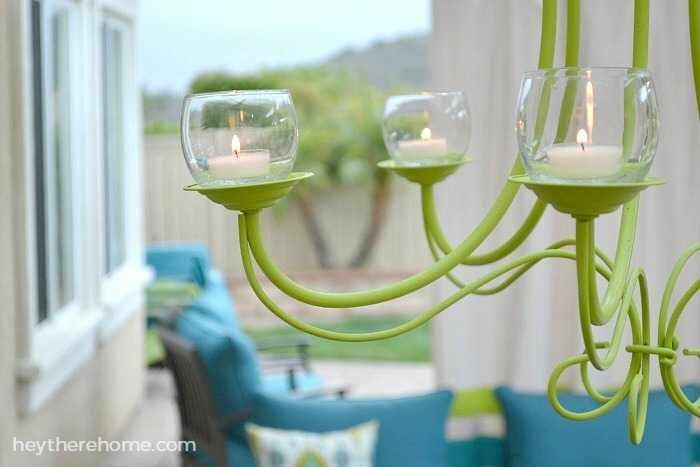 I love the candle chandelier, it looks beautiful and fits to your outdoor living room. I wish I had that in my house. This makeover is just gorgeous. I just found it on Pinterest and it’s given me just the inspiration I need. Love your redo! Looks so inviting……………. Love you dinning set but didn’t find it on the link? Can you give a little more info on it? Hi Debbie. Are you talking about the dining table and chairs? That is from World Market from a few years back. It is made of wood, so it has been refinished. I don’t think they carry this exact one anymore, but they are a great place to find mid priced outdoor dining furniture and I’m sure it is all on sale right now. If you were talking about the love seat and chairs, let me know via email ([email protected]) and I can send you the link. Hope that helps! Let me know if you have any more questions. WOAH, Corey!!! Such a stunning reveal. It truly is an outdoor oasis. I picture tons of family dinners, wine nights, and just overall fun with friends and family! Exactly what a backyard should be about!! Enjoy it! What an amazing transformation Corey! I love the colors you chose, and am super jealous of all the space you have! Beautiful makeover, what an inviting and fun space you have created! I would love an area like this! This is truly an oasis! I love your choice of color and the curtains make it a cozy retreat! All of it ties in so well! Simple beautiful! Loving how the colours come together and the calming effect of a great space. .
WOW! This is awesome! The glass of wine is a nice touch, too! Oh this is gorgeous! Love the colors your chose and the pergola is so nice with those curtains. I saw this on the bold abode link party and had to see it. I love everything about this space. The colors, the hanging light, the pillows. All gorgeous. I can see from the art work that you are in southern CA. I grew up in Oceanside CA and love having a ton of outdoor space. That weather allows you to enjoy it all the time. Just discovered your blog and can’t wait to read more! Love the white side table …Where did you get it ? World market ? Yep. It is from World Market! Corey, holy cow, this transformation is GORGEOUS! I love all the bright pops of color and I’m totally stealing that candle chandelier idea when we finally have a patio of our own. Can you please come redesign my house for me?? Absolutely stunning. Congratulations on a great job and I hope you and your family enjoy your space. Utterly stunning. Love your colours. It came together wonderfully. Great job Corey!! LOVE. IT! It all came together beautifully Corey!!! You’ve seriously thought of everything and each and every projects adds so much to the space! What a perfect place to hang out with your family and enjoy a lovely Summer! Thanks Kristi! We are loving the space and I’m kicking myself that we didn’t do it last year. Oh well, better late than never right? It looks AMAZING, Corey!! I love everyyyy detail! May I come over and enjoy a glass with you , friend? Turned out awesome! Oh,…and I saw you on apartment therapy the other day with your drop cloth curtains..Congrats! Pinning! Heck yes! When will you be here? Oh I’m so jealous! I love it. I love the colors you picked too. Absolutely perfect! I love the colors you have used in the outdoor space and the defined areas. Where else can you have a limey green chandy? That’s got to be my favorite! I love it Corey- it turned out so well…. so awesome to see all the pieces put together. Your drink station is amazing, and I love the wall art. So jealous that you get to live in Southern California! You must get to enjoy this space almost all year round!! Really? I’m jealous of your awesome view! It is missing a baby changing table turned beverage station, but that can be fixed! Kidding. Your patio space is stunning! I love what you did with the space!!! The colors are so fun and the curtains just make it so much more comfy feeling! What a wonderful transformation. I love the colours and how welcoming the furniture looks, but my favourite part is the green chandelier. I would love to have such an inviting space to relax outside with a book and a beverage. Corey!!! It’s totally amazing. I love every detail! Thanks friend! I’m just so glad I got it done. I have a bit of design ADD sometimes and jump to a new project in the middle of another. I guess summer was my deadline right? Turned out so excellent. I love spending time outside and it really makes such a different when your space is lovely and comfortable, too! Great work. It is beautiful, Corey! I can only imagine how amazing it must be to sit out there and relax with your family. I hadn’t seen your paint stick art yet and I love it! Great job!